Many good things are going on almost behind the scenes in our career programs. I visit a lot of very good Automotive programs and here is one that is special to me. I first met Cory and Don via the New Teacher class at Valdosta State. 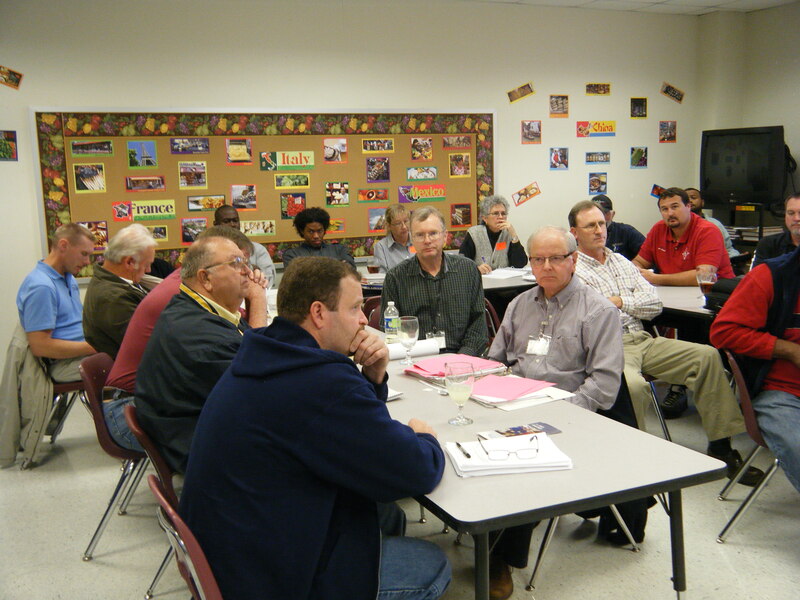 Dr. Charles Backes has taught this course for new Trade and Industry teachers for quite some time. I presented to the class Corey and Don when they started teaching and right off I knew they were remarkable! They have never let me down. They took an old, outdated and unsafe auto program; and created a safe, industry recognized learning environment. The program supervisors Mr. Bruce Crook and Ms. Lynne Wilson have every reason to be proud of these two teachers, as they demonstrate excellence in education! It is wonderful to see what happens when professionals with the right attitudes get together on a team effort. The Business and Education meeting starts with a lunch and everyone is introduced. 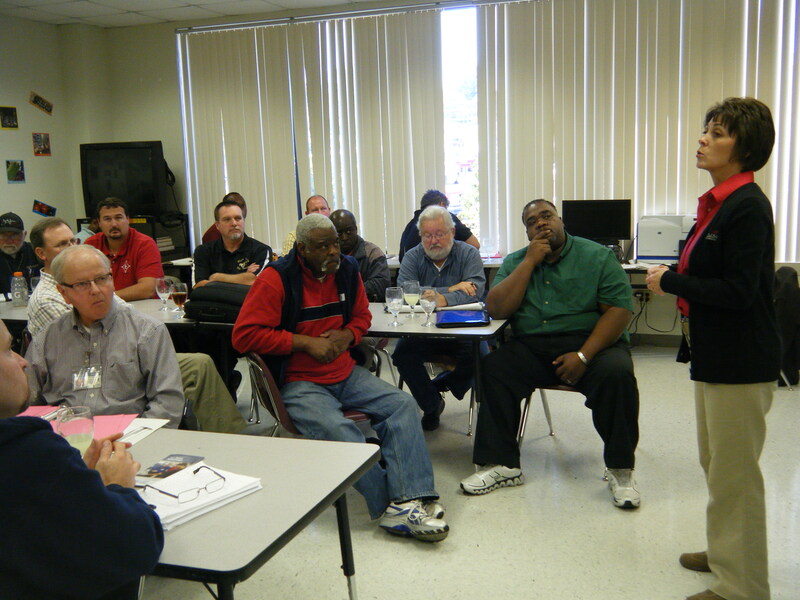 Corey introduces former student and now Griner Cadillac’s master transmission specialist Michael Powell to his right. 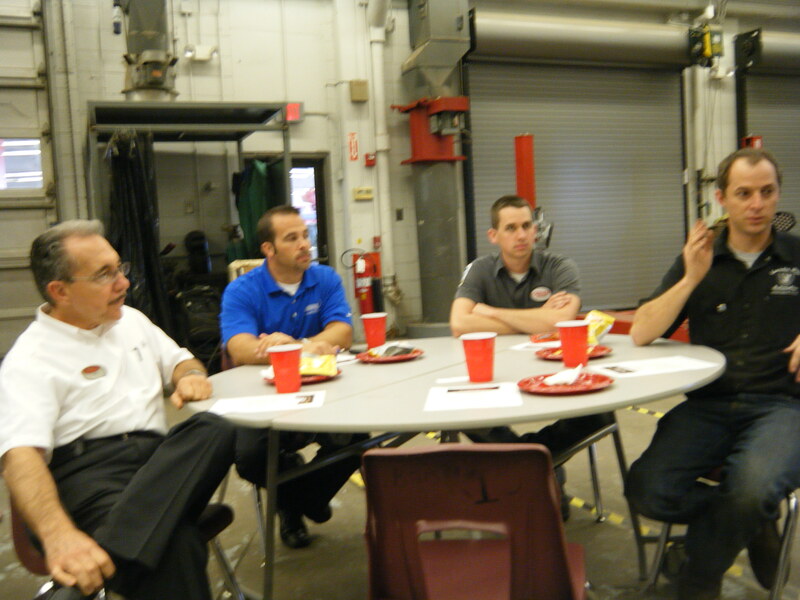 Mike Marafino,(white shirt) service manager Griner Cadillac looks on, as does Steve Riley,(blue shirt) service manager, Langdale Honda listens to Corey. Many of the members have current and former students of the program as employees. All agreed that the AYES model of the mentor and intern will benefit the franchise and the students of the program. 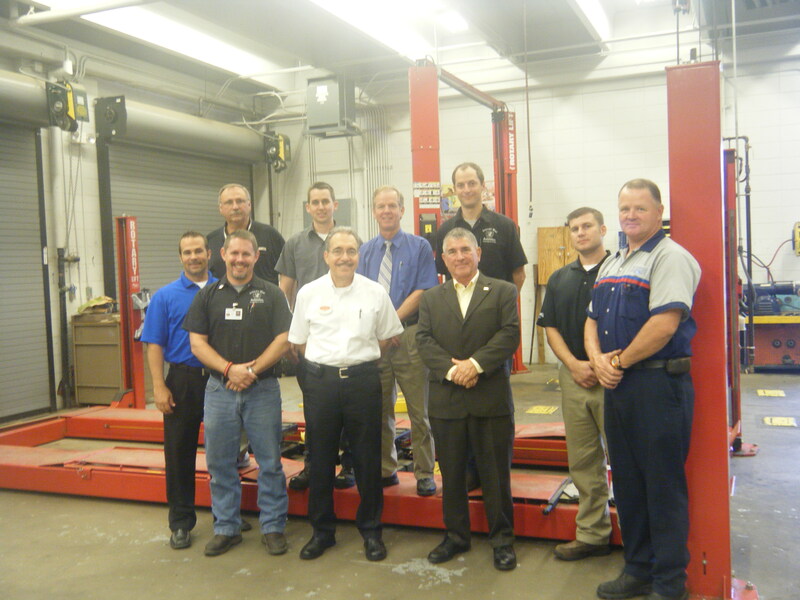 Automotive Program recently approved affiliation with AYES. The purpose of Automotive Youth Educational Systems (AYES) is to develop career-ready, entry-level automotive technicians and service personnel through a series of Business and Education partnerships. High school automotive technology students are presented the opportunity and guidance to explore rewarding automotive careers, and provided the tools and support to learn, develop and practice the technical, academic and employability skills needed for success. The capstone of the AYES model is a 320-hour workplace internship, usually during the summer between the junior and senior year, where working along side a trained and qualified mentor – usually an ASE-certified Master Technician – the student prepares for entry-level career. 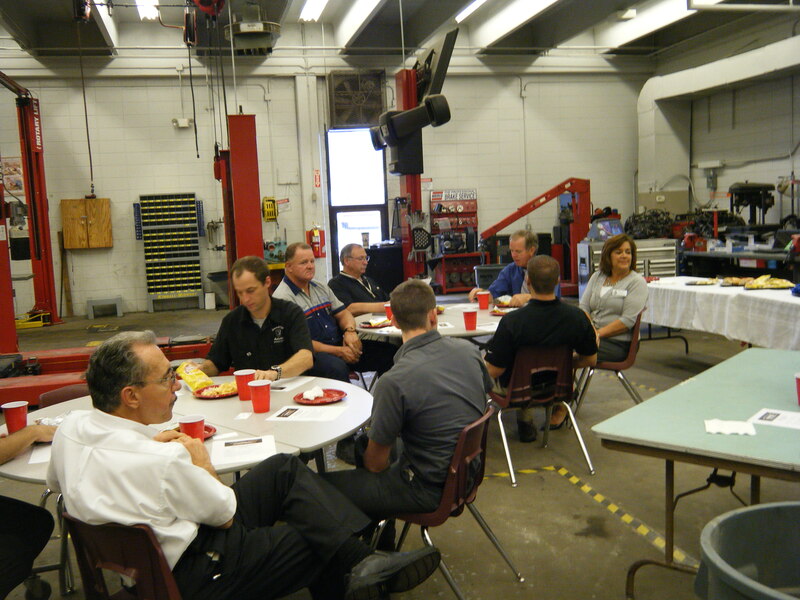 The Automotive program is fortunate to have two highly motivated teachers. Here is more about these excellent teachers. Don Faircloth II – Don is married with 2 children, 19 and 13. He has been an Automotive teacher at Lowndes County High School in Valdosta, Georgia for 9 years. Don has been around cars most of his life. He helped his father rebuild his first engine at age 7, and rebuilt his first engine solo at age 14. After his time in the U.S. Navy studying Nuclear Physics, he returned to Valdosta and began a career in the automotive industry. Don has worked in many aspects of the industry; from managing an AutoZone parts store for 5 years, to working at independent garages, to working at factory dealerships before receiving the opportunity to become a teacher. Don is an ASE Master Technician, as well as a Ford Master Technician. He has received over 600 hours of specialized training from Ford Motor Co. Since Don has began teaching in 2004, he has returned to school and received his Bachelors of Science in Education and his Masters of Education degrees from Valdosta State University. He is currently on track to start his Doctorate degree in the spring. Teaching is Don’s passion. He loves the opportunity to shape our youth into valuable and contributing members of society and help keep our industry thriving through generations to come. Corey shared how many new items were recently purchased for the students to use in training. Corey Nawolski is an Automotive instructor at Lowndes County High School (LCHS) in Valdosta, Georgia. He began working on cars with his father as a young child. 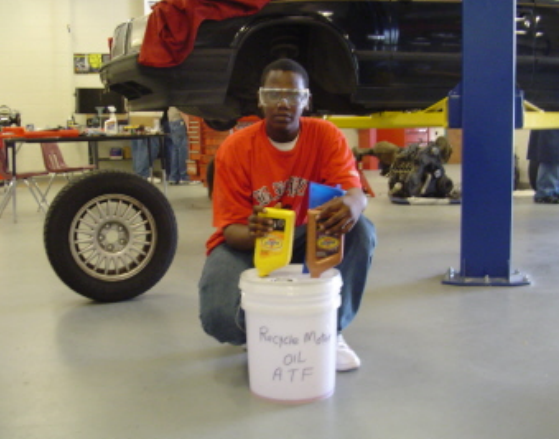 When Corey enrolled in High School (at Lowndes High), he began taking automotive classes. During his senior year, Corey transitioned into the Youth Apprenticeship program where the school systems transportation department employed him. 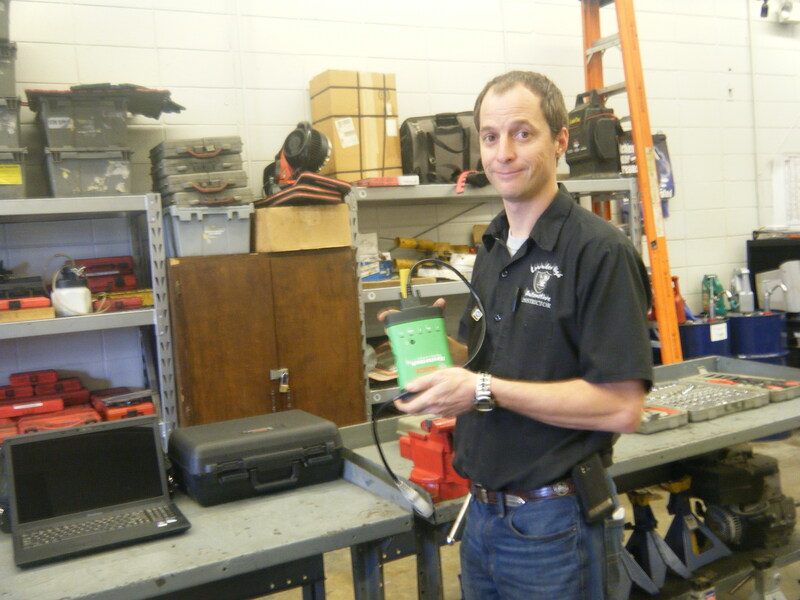 In 2005, Corey transitioned from being a technician into the teaching profession. In 2009, he was honored as the Georgia Association for Career and Technical Education (ACTE) New Teacher of the Year; Corey then went on to win the New Teacher of the Year award for Region Two (Southeastern United States). While actively seeking to improve the LCHS Automotive program, Corey has pursued higher education. He has completed his undergraduate and Master’s degree. In addition, he is working on his doctorate and should complete it during the upcoming summer. Outback and in Sight, Used Oil and Safety Glasses or How many lawyers do you know? What is my responsibility to all these rules and regulations concerning the environment? Safety? Often on visits to schools and colleges I find some that are unsure of what the requirements are for compliance with EPA and OSHA regulations. Some even think that these federal regulations and state laws do not apply to schools. Well, I would not want to be the instructor or administrator that was responsible for a violation. In the 21st century we are all personally responsible to our society to be aware and protect the environment by being good stewards of our world. When I was a youth dumping used oil and other fluids was considered OK as long as you dumped it somewhere else. Today you and your facility can be held liable for even small oil spills or negligent storage practices. All states consider used oil a hazardous waste and hold the generator of the oil liable for proper storage and disposal. To become a known polluter would be foolish in today’s litigation prone world. Oil storage that is open to rainfall is apt to leak in to the ground water. Oil and fluids stored out in open are hazards to spills however accidental and that makes the person who authorized or was in charge of the materials responsible for their proper storage and safe conduct to the recycle center. I feel the old rule of “CYOA” applies in making sure my shop/lab is in compliance. It is very simple to comply with the regulations. All hazardous materials: used oil, trans fluid, brake fluid, paints, solvents, coolant, batteries and used parts should have a visible closed loop back to a recycling facility or supplier. Nothing from your shop/lab should go to the landfill. 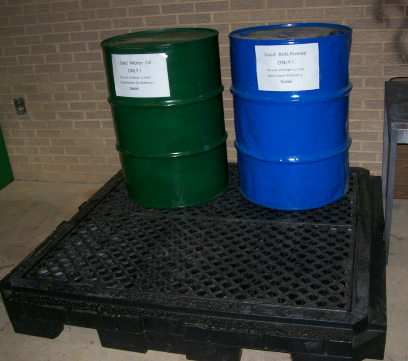 Have a spill containment platform with proper storage drums/containers for all fluids. Use a lid or covering with a funnel system that is easy for students to use in transfer of fluids. 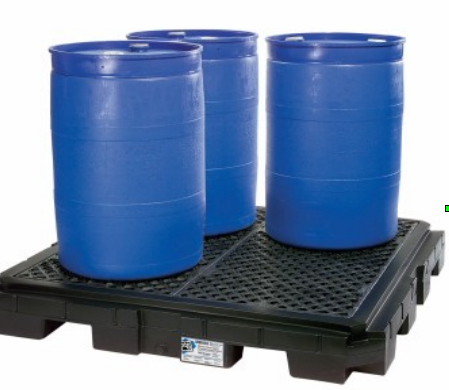 Fig#1 This containment pallet and two drums is an inexpensive solution. This needs to be underneath a shed or overhang where rainwater will not collect on drum tops of course. Also, used lead acid batteries may be stored here until routine collection to a recycle center. Fig #2, A commercial set for spill and storage containment. www.newpig.com Even this set up would need protective lids and cover from rainfall, high winds and impact damage. Personal Protective Equipment is required for all persons in contact with hazardous material. This means you and your students, Reference Ga. Code O.C.G.A. § 45-22-2 (all states have similar statements) This means compliance with right to know and MSDS requirements being followed with a documented safety and HazMat training. I will recommend a certificate program like www.sp2.org that will give certification and validate your training of student/employees. This will also cover you in the event of an accident in your lab. I will never understand the “Push Back” I get from teachers in auto labs that don’t require students to wear safety glasses. Many times I visit otherwise good programs to find students in the lab working without safety glasses. I recently visited a lab and students were grinding metal with air grinders and no PPE or glasses were in use. When asked the instructor replied he had gave up trying to make them wear them. Another teacher said he never wore them at work and did not see the need to make kids wear them. I visited two labs a few years ago with the director and when we observed students working in the lab without safety glasses and I stated the requirement for safety glasses the instructor and the administrator asked me where that rule was as if it were not a common sense practice to protect students from eye injury. I have a video (Safety Glasses)of students holding a brake clip that had cracked the student’s safety glasses when the clip broke while he was working on the brakes. That is why we call them accidents. NATEF requires this as a Go-No-Go for accreditation of the program.As always NATEF is the final authority on their standards. Please check with http://www.natef.org for latest updates. Comply with personal and environmental safety practices associated with clothing; eye protection; hand tools; power equipment; proper ventilation; and the handling, storage, and disposal of chemicals/materials in accordance with local, state, and federal safety and environmental regulations. A quick google brings up more information. Here is the summary. PUBLIC LAW 96-463 defines used oil as a hazard to human health. O.C.G.A. § 12-8-62 (2011) quotes the above law in defining the handling of used oil. All States have similar laws and rules. Fig # 3 a student with an oil saver he made for use in lab. The drop or two of oil in the bottles is collected in the bucket for recycling in stead of the trash. The plastic bottles are recycled also. This company will be pleased to explain the rules, law and regulations that apply to you and your facility. They are qualified experts that can advise on products and their use. I find them easy to work with in understanding EPA and OSHA as it pertains to schools. If I can be of service to you or your teachers with training, information please let me know. In all these safety issues I would rather be over than under when in comes to meeting the safety issues we all face in our auto labs. Remember this “It is not about budgets, school boards or facilities but the safety of the individual student as they are in the learning environment you provide” Be aware, Be informed, Be safe! I hope you were fortunate enough to attend the NACAT conference in Charlotte this past July. The very best in training, teachers and fun for all was there. The staff at CCPC was awesome. The fellow teachers were wonderful and almost all my heroes were there. The presentations were as they should be; on the cutting edge of technology, informative with all the latest and greatest explained in detail by the authors and creators. Very much an enjoyable and restoring week. As one of the seven principles of Covey “Sharpening the Saw” is important if we are to do a good job of serving our customers. See the NACAT.org web site for more on the great workshops we enjoyed! Many times during the week I was reminded about how important it is for us to rely on each other. No one else knows the difficulty of the duties of an auto teacher. The vendor that has never been in a classroom of teenagers does not have a clue as to why his great product won’t meet our needs until classroom control can be achieved. The engineer that can expound for hours on the inner workings of the automobile and can’t build working professional relationships with students is at a loss to explain why he/she can’t seem to hold a student’s attention. The academic teacher that has never had to deal with the retail customer driven world can’t understand our passion for excellance in our teaching. We know that the automobile owner will hold their auto techncian and service center to a higher standard than their Doctor. We know that our students don’t care what we know until they know we care. If you were able to attend Jeff Curtis’ presentation you now know how not to do a power point. If you attended the NATEF training for ETL’s you now know how important the integrity of the evaluator is for the validation of all our programs. Many of the teachers I spoke with are sincerely concerned with the state of our industry. Many new teachers were there and that is good, but it only means we have more to do in the nurturing and support of these new teachers. There is a lot we need to know to do this teaching, way more than new ways to do a volt drop test that I learned or to safely train our students to service Hybrids in an excellent fast paced class by Craig. There is a lot to know and a lot to learn. I am thankful for NACAT and all they do for us. We all mourn the passing of one of my heroes, Fred Hines and we see the retirement of many good teachers each year. Where will the new champions come from? We must nurture and protect our new teachers. Best wishes for the school year…………. You are currently browsing the archives for the Auto Teacher category.